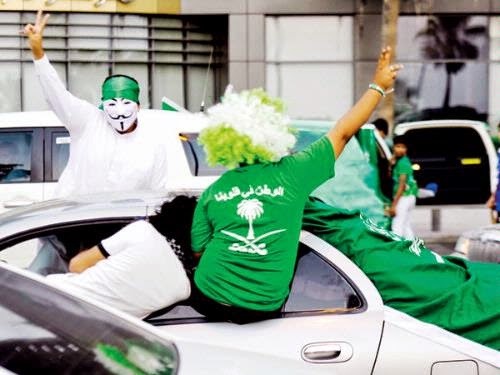 Tuesday was Saudi National Day. 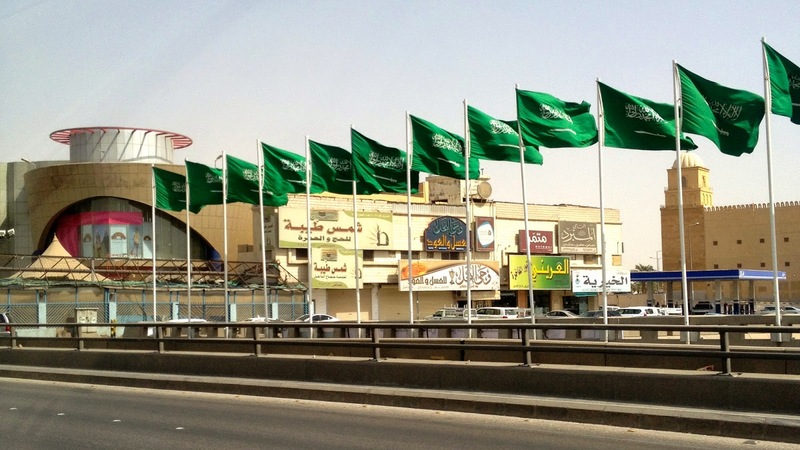 National Day’s a public holiday celebrating the 23rd September 83 years ago, when King Abdulaziz created the independent state of Saudi Arabia. Green flags wave cheerfully along the sides of motorways and people converge on streets and in parks for promised festivities and fireworks. Generally speaking, it’s something families enjoy and celebrate together. However, there’s an alternate perspective that seems to match up very well with opinions expressed by some Saudi women I talked to earlier in the week. Their antipathy was palpable. As for us, we stayed indoors on Tuesday like many of our neighbours and friends. We really weren’t too tempted by the promised festivities or picnics with fireworks by the National Museum. You see we’d experienced a similar festive occasion shortly after we’d arrived. Driving through the city on the way home after a meal out, we encountered crowds returning from a soccer match. The mood was celebratory so the favoured team must have won. Patriotic fervor and excitement manifested itself on the roads through crazy driving. Young men hung out of open car doors and windows. They sat aloft car tops, all waving flags from every possible vantage point. Small thobe clad boys, screaming with excitement and waving flags, were pinioned against front window screens as cars careered and drifted dangerously out of control. It was mayhem on a scale we’d not seen before and not an experience we’re keen to repeat. Then again there was little tempting about a picnic or fireworks in the gardens by the National Museum. Granted the evening temperatures now make sitting outdoors very pleasant and the National Museum is a very attractive setting. However the last time we were there on a similar occasion, small children playing in the fountains and paddling in the streams were also using the water as toilets. The smell was something else. There's also the fact - unfortunate but necessary to acknowledge - that expatriates going out on National Day can attract unwanted attention. Friends of ours who ventured into the city last National Day left in a hurry when they had stones thrown at them. So, all things considered and like others around us, we stuck with our choice to stay put. Safer, easier and a whole lot less stressful.